Description: Perfect tradesman``s accessory. 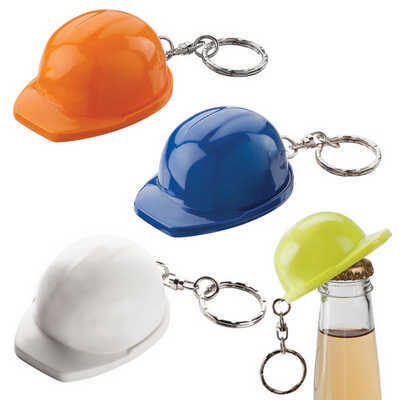 Hard hat shaped blue plastic keyring with bottle opener function. Available in 4 colours. Features: Packaging: Polybag. Colour: Blue. Material: Plastic Product Size: 31mm(h) x 47mm(w) x 62mm(d) - Helmet only. Freight details: 500 per carton, 16.8kgs, 39 x 25 x 60cms; Decoration Type(s): Colour Print / Full Colour Print . Decoration Area: Pad - On Side: 17mm(w) x 10mm(h) or On Front: 20mm(w) x 13mm(h). See drop down menu for decoration options.